Maymont Park in Richmond Va has been on our list of places to shoot at. Mark & Fatima were the absolute perfect couple to make this happen! I couldn’t imagine a session with a more perfect couple exploring a new location! Maymont did not disappoint, and I have a feeling that we barely scratched the service of this beautiful park! Luckily one of my brides saw our stories from that day and immediately booked her bridals there! So we will back in less than a month! These two drove down from Arlington and spent the evening with us this past Monday. Luke and I have been looking forward to their session since they booked us. Their personalities over the phone were so welcoming and friendly, we just knew meeting them would be so much fun and we were right! These two had us laughing and cheering throughout the session because even though they might not believe it, they are naturals behind the camera! I mean just look at this session! 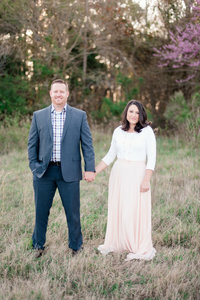 I love spring engagement sessions! We can pull out the pretty dresses, the trees are blooming, and we are not sweating halfway through just yet! Fatima and Mark lucked out with all the pretty cherry blossoms and more! I love that we were able to get such a variety of pretty flowers throughout their session! These two have style! Mark was all dapper and GQ and Fatima was stunning! I loved the dresses she picked out and they looked amazing on her! I cannot wait to see them all dressed up in their wedding attire! If they looked this good for their engagement session, can you imagine what they will look like on their wedding day??? We are exploring all things new with this gorgeous couple! First Maymont, and then Trump Winery! We are so excited for their wedding at Trump Winery in August! Luke and I have yet to shoot a wedding or even visit Trump Winey so we are excited to shoot at a new venue for us! I know that their wedding is going to be absolutely gorgeous and very fun filled day celebrating these two becoming husband and wife. Mark & Fatima, You guys are seriously awesome! We had so much fun with the two of you and we look forward to capturing your beautiful day in just a few short months! We already love you guys and we hope you enjoy some of our favorites from your session! More Beautiful and Fun Engagement Sessions Below!